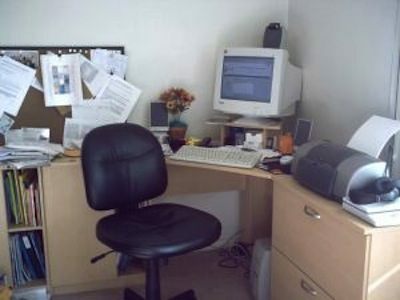 Today, thanks to the wonders of modern technology, setting up a home office is easier than ever. For many people all that’s needed is a laptop, a printer and a decent broadband connection. Most homeworkers, of course, will also need a desk and somewhere to keep stationery and other office basics, not to mention a space conducive to productivity. So, when creating your study, it’s worth creating the right environment from the start, rather than shoehorning your new workstation into an existing part of your home. Once you’ve decided exactly where your home office is going to go, a bit of decluttering may be in order. This could involve some tough decisions about throwing – or giving – some things away. For your more valued belongings, however, there is the option of storage. If you need to store clothes and bedding, place a suitable wardrobe in your storage area. This will allow you to hang shape-sensitive garments while stacking linen and shoes at the bottom. Leather handbags and purses should be stuffed with bubble wrap and placed in breathable containers such as purpose-designed plastic boxes or cotton pillowcases. Avoid folding the straps or packing items tightly together as this could leave creases or impressions from buckles. Books, collectively, become very heavy. For this reason, pack books in small boxes. Keeping them horizontal will protect the spines over the long term. It’s worth making notes on the visible side of each box in case you need to find any particular book while it’s in storage. Keep wooden furniture safe by giving it a waxing or a coat of wood varnish. This will protect it from any moisture in your storage area. Dismantle any item that flat packs to maximize the available space – but don’t forget to leave the fixings in a small bag, taped to the piece. Once in place, remove the risk of scratches and other damage from contact by placing thick cloth between touching components. As your business grows, so may your business storage needs. You may, for example, need space to keep promotional literature, stock and archived files such as tax returns. You can make this process a lot easier by storing papers and documents securely offsite. Records are important and have to be maintained, but storing them requires a lot of space and self storage allows you to keep your files organized in one location making them easy to sort through when needed. After you’ve done this, any paperwork that can be found on a website or email should be recycled. These tips are provided by Big Yellow Self Storage, specialists in business storage. Who knows that building an office would be as easy as this nowadays? We can also gather and organize all our files in our computer to make our office space cleaner and light to see. Although it always better to keep an original copy that was also easy to reach in times that we need those.